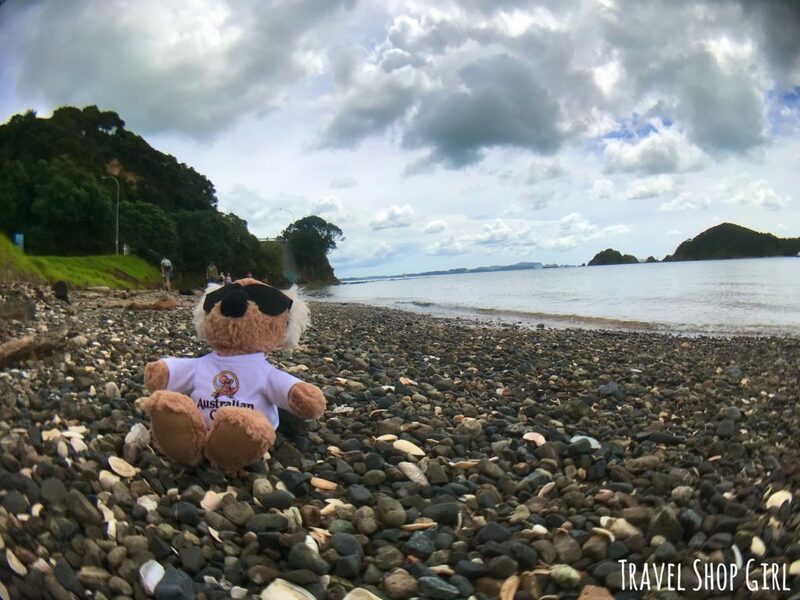 After our time in Auckland, we immediately had another port of call in New Zealand at Bay of Islands. Our home for our world cruise, Fred. 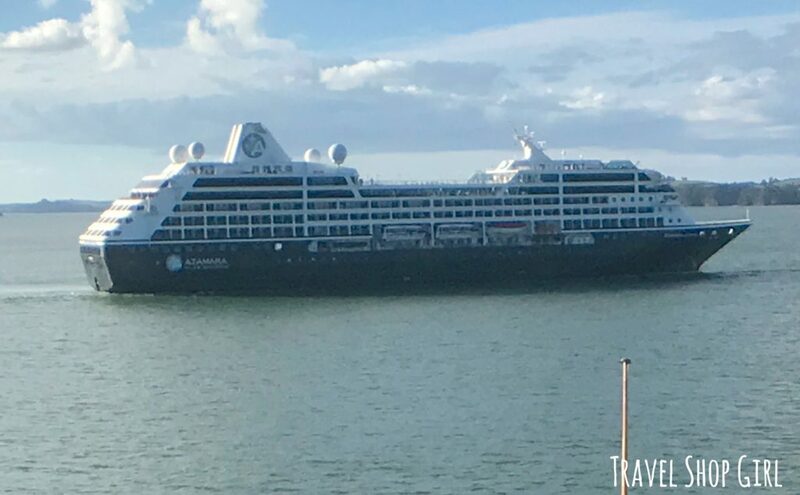 Olsen Cruise Lines Black Watch anchored offshore near another ship, Azamara Journey, and it was lifeboats as tenders to get ashore. After breakfast, Danielle and I collected our belongings and made our way down to get on a tender. Luckily, the seas were calm and getting on and off the tenders was relatively easy. This made Danielle very happy as rough seas and rocky tenders aren’t exactly her favorite. Once off the tender, we only needed to walk across the street to catch a glimpse of a market in the town square. There was jewelry, clothes, art, souvenirs and more for sale and we also ran into one of our new cruise friends, Peter from Amsterdam. 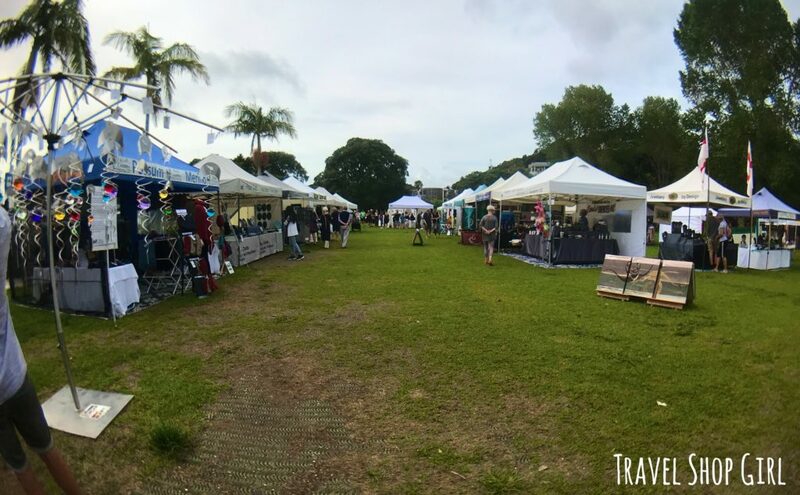 We looked a little more at the items for sale and decided it was time to check out the rest of Paihia. TSG Tip: Might I recommend a cruise gym buddy for your next cruise? Peter is always in the gym on sea days. If I decide to sleep in or not go, I feel bad because I know he’s not going to skip a day. Guilt is the ultimate motivator. 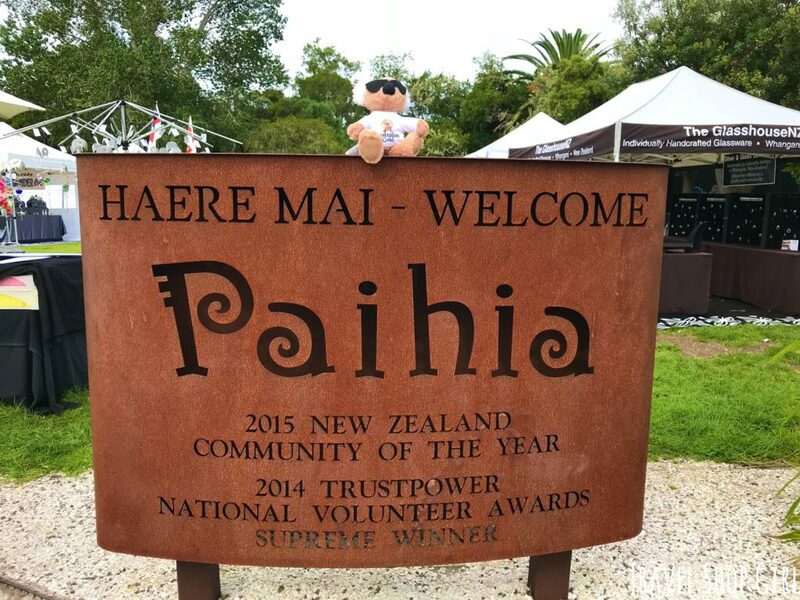 After setting Sydney from Australian Gold on the welcome to Paihia sign, we decided to wander the town on our own. We never leave our cabin without using Australian Gold products and it seemed only fair to take Sydney out for the day with us. Even on partially cloudy days we use our 30 SPF sunscreen to keep our skin healthy and safe. Our first stop was the supermarket where we picked up some water and Powerade. 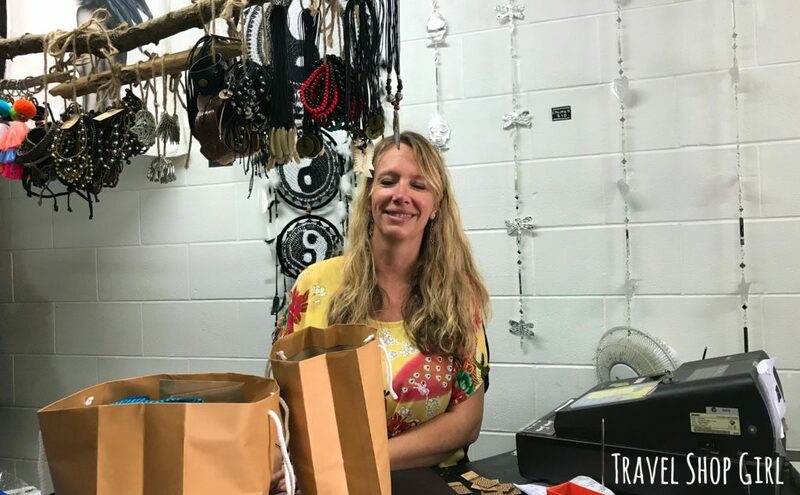 Then we started looking in some of the small shops and boutiques that line this quaint town of Paihia and I found Suma Suma. This is seriously one of the best clothing stores I have ever found anywhere and if I could’ve, I would’ve bought the entire store. The selection is from around the world and are in bright colors and patterns. Just the kind of clothes you want when traveling around the world. Instead, Danielle and I spent over an hour combing through the racks of dresses, tops, and pants looking for comfortable clothes to wear for the remainder of our cruise. I left with four dresses, a jumpsuit, two tank tops, and a hamsa hand necklace. I was so impressed by Elsie, who worked there but I thought was the owner. How often do you find passionate employees who care so much about the products and customers? We told everyone we passed on the street from the ship about the shop to encourage them to go there. Dresses were around $32-$37 NZD or about $23-$27 USD and that’s what I call an amazing deal. TSG Tip: This is another reason to go to the gym, even when you don’t want to. I normally hate shopping for clothes, but a visit to the gym every sea day and I don’t mind it as much. After shopping, Danielle suggested we go pick seashells off the beach at Horotutu Beach. Along the way, we ran into our friends, Filomeni and Stelios who had also picked shells and were now returning to the ship to drop things off and then come back for more shopping. 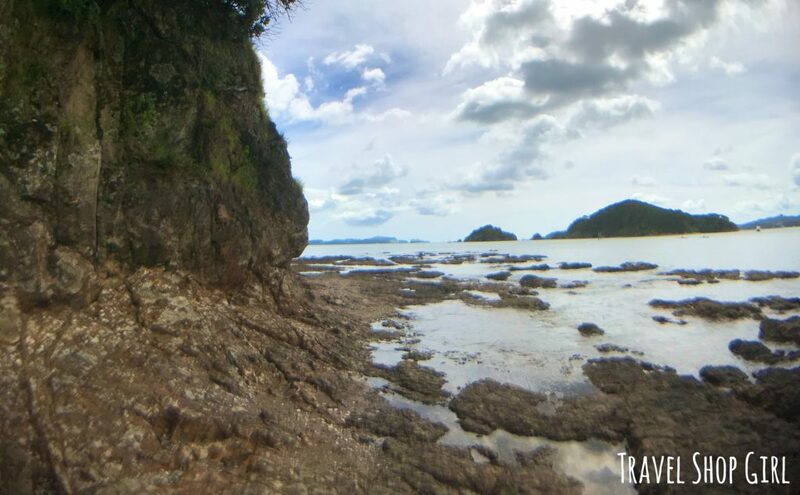 We walked along the sandy beach for a while, enjoying the peace and quiet with only the sound of the waves crashing slowly against the shore to keep us company. Even Sydney from Australian Gold made an appearance, taking a few minutes to enjoy the beach, too. 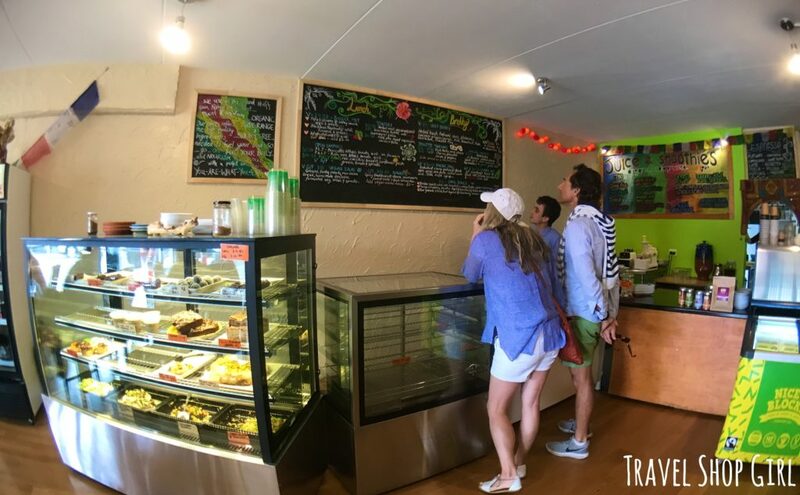 Soon enough our attention turned to food and we decided to check out the restaurants in Paihia. There are many including ones that offer pizza, seafood, sports bars and restaurants, Chinese food, and health food. 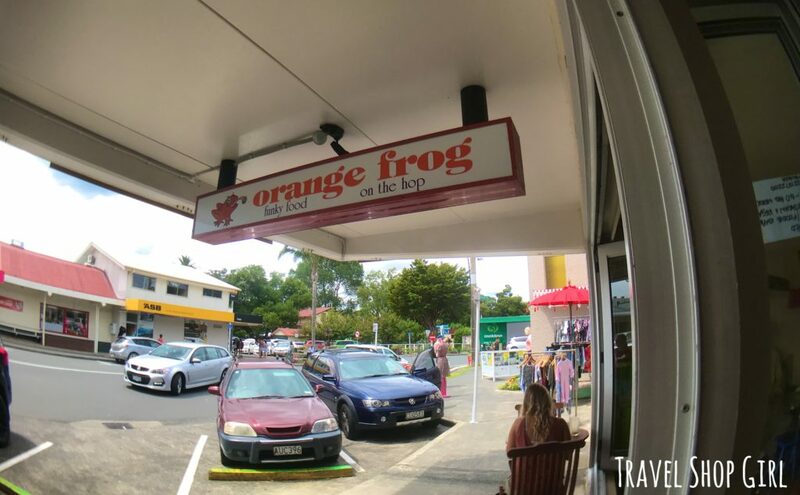 After searching a while, we landed upon the Orange Frog, which, if you can believe it, offers both vegetarian and vegan options. 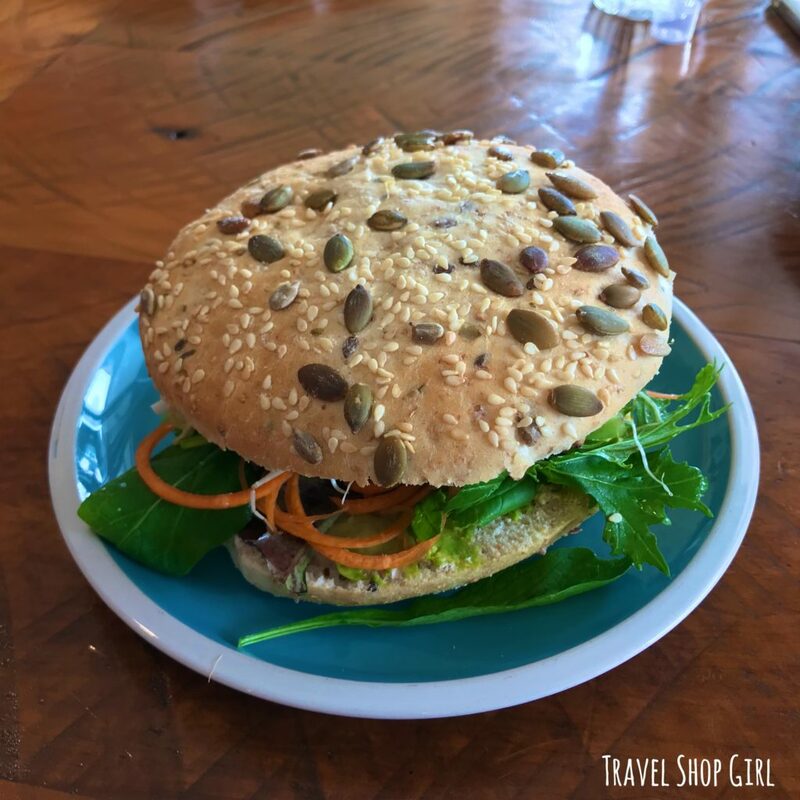 I had a tofu burger with peanut satay sauce, rocket, carrots, and sprouts on a seedy bun. I thought for sure I’d about half and bring the rest with me back on the ship but it was so good I devoured it in its entirety. Danielle had a bean and cheese toastie, which was basically a square burrito or quesadilla, depending on which way you look at it. She also asked for a side of beetroot (beets for American readers), the one vegetable I cannot tolerate. Yes, she is my bestie but we clearly are so different in so many ways. After lunch we walked around a bit more and shopped for more souvenirs, including t-shirts and other small items. Then we decided to walk in the opposite direction in which we came and happened upon another beach called Catseye Beach. 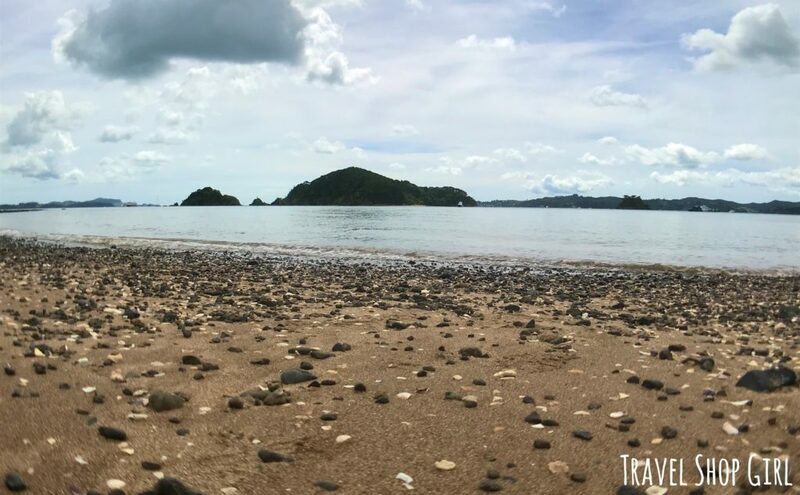 There were tons of shells strewn about and we spent some time picking through what we might want for ourselves among the many options. After the beach we walked back to the ferry terminal to catch our tender back to the ship. 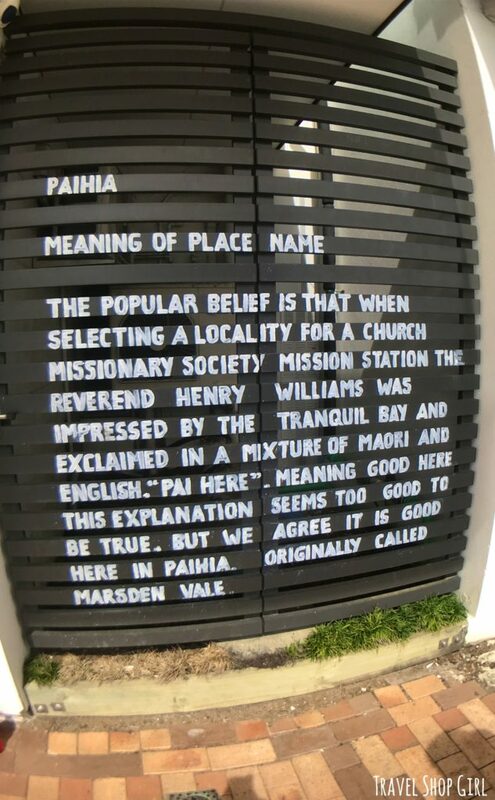 Paihia is an interesting little town of about 1,900 residents. 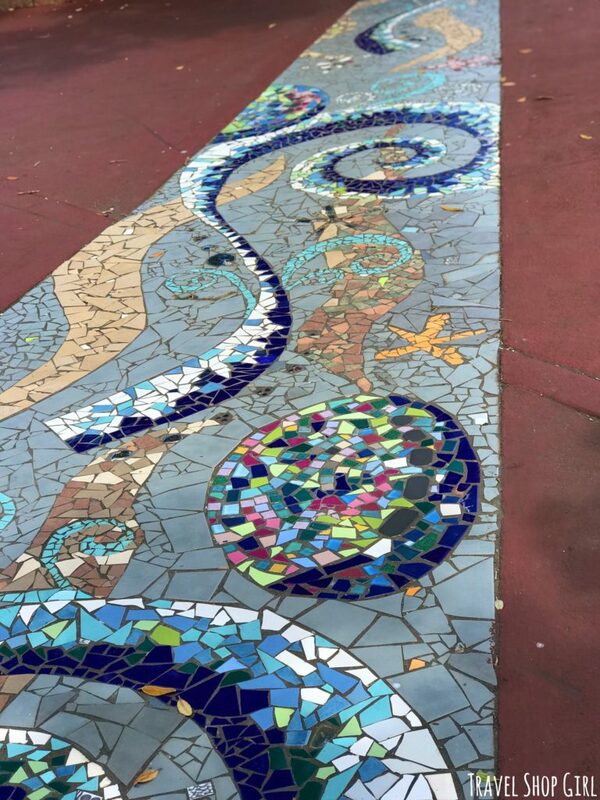 I loved the art that surrounded the port area including the sidewalks, the dolphins, and the creatively painted barriers along the port area. 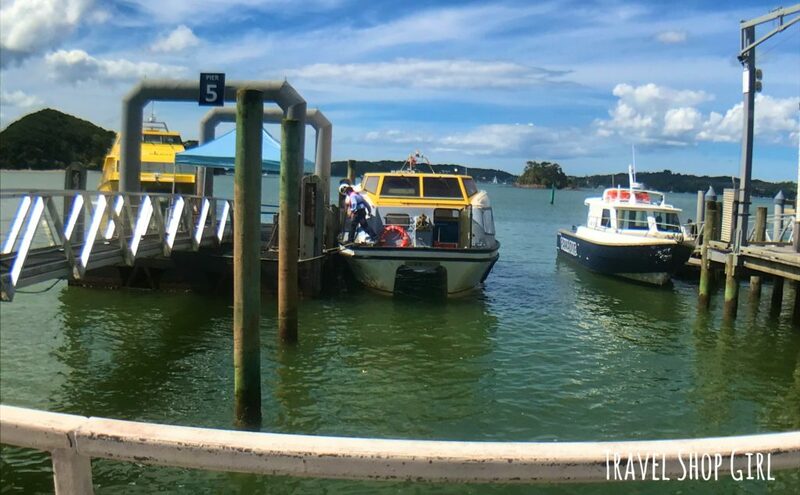 All in all, Paihia, Bay of Islands turned out to be a relaxing kind of port day filled with great shopping finds, delicious vegan food, and even a little bit of a beach day. 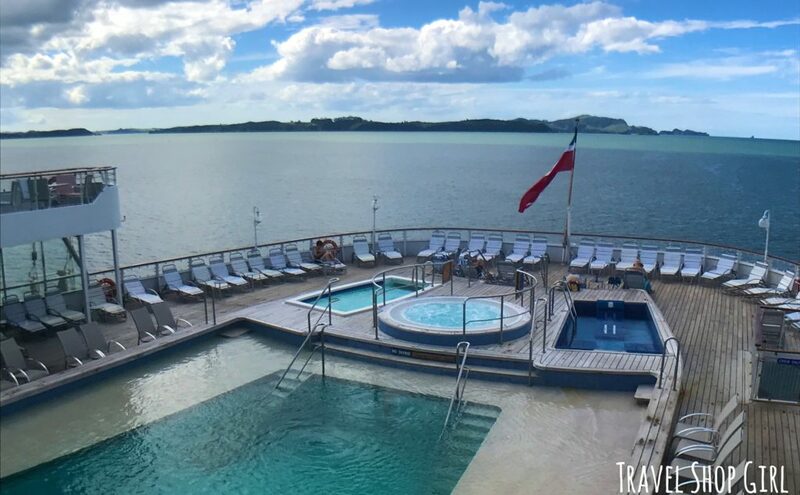 It’s definitely the kind of day everyone should have at least once on a cruise and/or while in New Zealand. 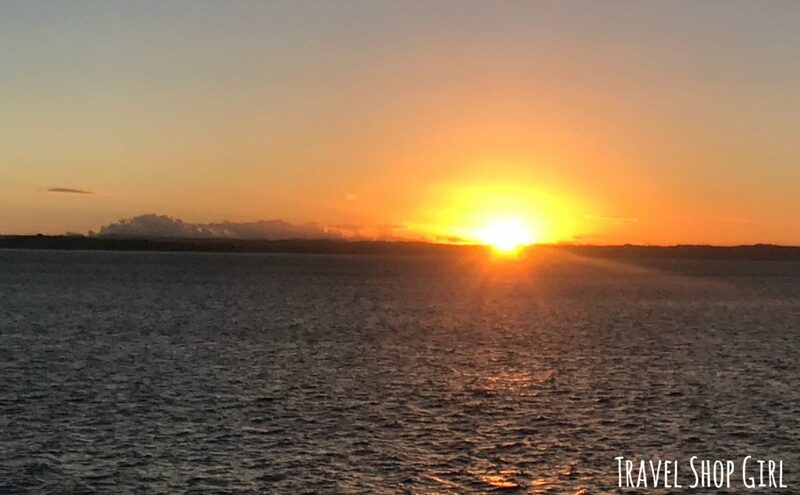 Danielle and I returned to the ship for sailaway and a spectacular sunset at sea. Is there anything better than that? 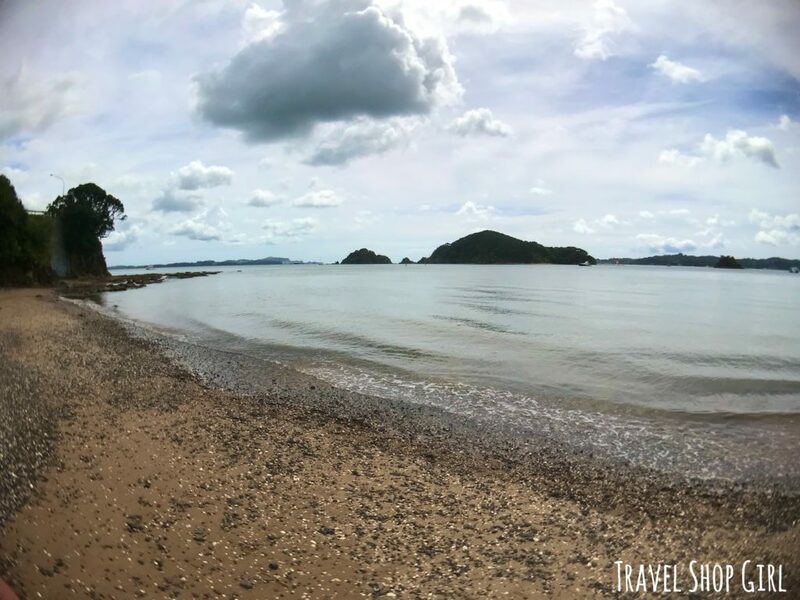 Have you visited Bay of Islands? 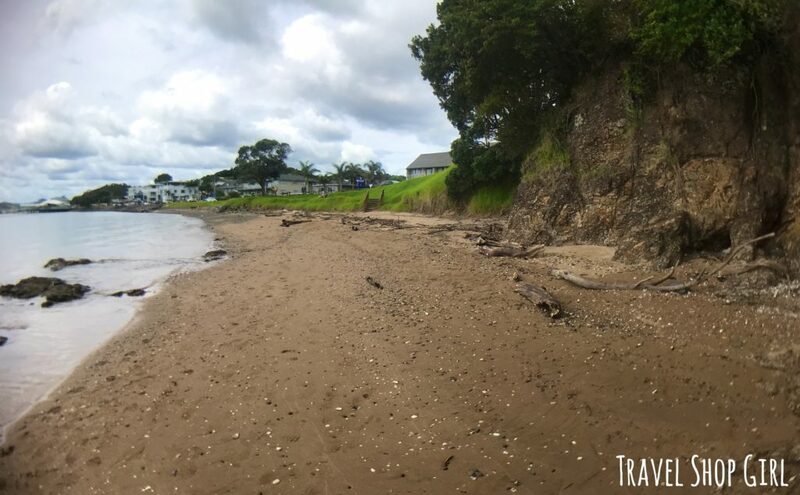 Can you suggest other destinations in New Zealand that you found equally exciting? Don’t forget to leave your comments below. Discover some other great destinations and travel ideas here on the Travel Shop Girl website. 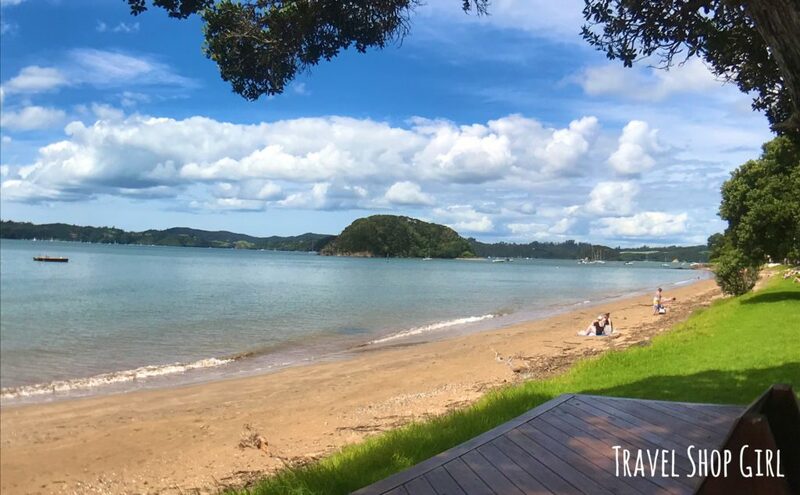 On my new SPONTANEOUS TRAVEL SCALE of 1-5, with 1 being super easy and spontaneous and 5 being you better plan far in advance, Bay of Islands scores a 1 for spontaneous travel since it’s easy to get to and there’s plenty to do without booking in advance. While Australian Gold has provided me with sunscreen products, as always all opinions and photographs, unless otherwise noted, are my own. Beautiful. 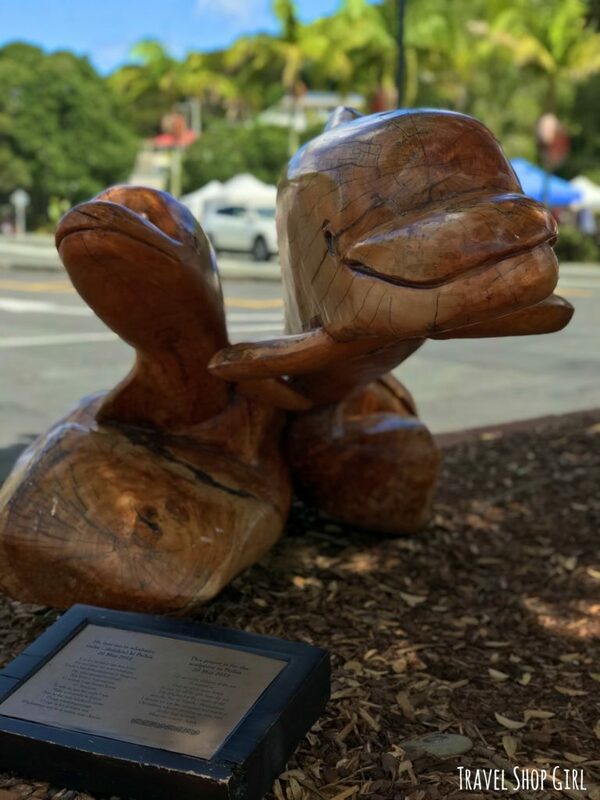 Love reading about your travels.